Legend has it that the emperor Kulasekhara Pandyan was the founder of the ancient city of Madurai. He was succeeded by Malayadwaja Pandyan. Malayadwaja Pandyan and his consort Kanchanamala who did not have any children of their own, worshipped with the desire of obtaining progeny. During the course of their ceremonial prayer, a baby girl appeared in the sacrificial altar miraculously. The Royal couple brought up this child as their own and named her Tataatakai. An odd feature about the baby was that it had three breasts instead of two, and that a divine prophecy decreed that the third one would miraculously disappear, at the princesss sight of her consort to be. Tataatakai grew up to be a valorous queen; she was also known as Meenakshi, the one endowed with fish like eyes. Tataatakai embarked upon a DigVijaya or a tour of victory, across the length and breadth of the Indian subcontinent. In the course of her travels she came to Mount Kailash where she encountered Shiva; upon standing in front of Shiva her third breast disappeared and a valorous warrior princess transformed into a blushing bride. Shiva directed Meenakshi to return to Madurai, and promised her that he would join her in eight days as her groom. Accordingly Meenakshi returned to Madurai, and at the appointed time, the divine wedding was celebrated with pomp and splendour. 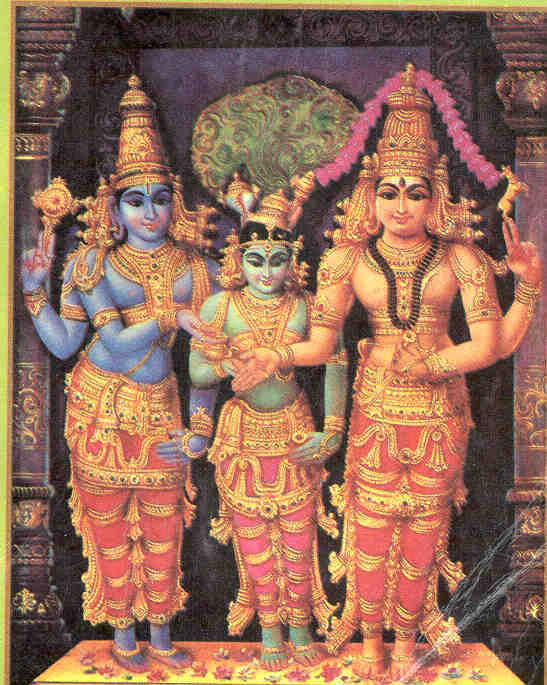 Maha Vishnu, believed to be the brother of Meenakshi is said to have given the bride away. Legend has it that Meenakshi and Sundareswarar ruled over the city of Madurai for a long period of time. Sundareswarar also goes by the name Sundara Pandyan. Ugra Pandyan the son of the divine couple is believed to be none other than Subramanya. The legend of Meenakshi Kalyanam brings together four of the six main streams in popular Hinduism i.e. the Saiva, Shakta, Vaishnava and Skanda faiths  and this grand culmination of faiths is still celebrated in great splendour today, in an enactment of Meenakshi Kalyanam each year, when images of Skanda and Vishnu are brought to the Madurai Meenakshi temple from Tirupparamkunram nearby. Also of significance is the grand procession of Kallazhagar towards Madurai from the Alagar Koyil temple in the outskirts of the city.